“Without effective debt restructuring a left government would find it impossible to implement an alternative programme, even in the short run” … “There can be no conflict within the EU on [the debt restructuring] that would not also raise the spectre of EMU exit”. 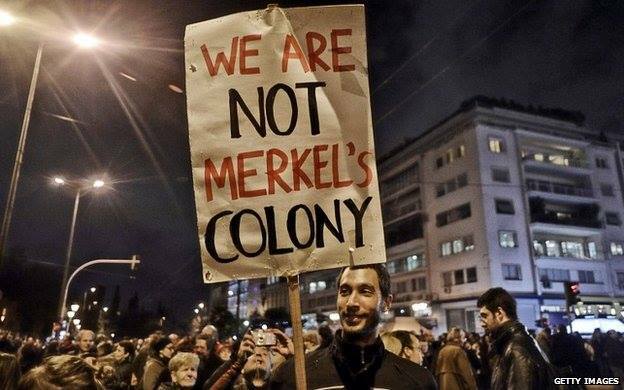 They turn to the practicalities of Grexit. They suggest that a left government should start by insisting on the independence of its bank from the Eurozone, including alternative currency (i.e. short-terms paper loans, or “scrip”) denominated in Euro. This paper currency could become the first step towards re-establishing a national currency. A left government should also have capital controls to prevent money leaving the country on exit. Lapavitsas and Flassbeck call for social mobilisation and negotiations towards a voluntary exit from the EMU. If consensual exit was not possible, Grexit could take place by first declaring a default on the country’s debts and ceasing to pay them, then redenominating the balance sheets of the central bank, commercial banks, private enterprises and households. The government would have to increase its circulation of money and should expect a sharp devaluation of its currency. Medicine, food and fuel would need to be administered (i.e. rationed) to get basic goods to those in need. While they paint in some ways a brutal picture of a government necessarily operating in temporary conditions of extreme scarcity, they do also emphasise that the countries of the European periphery have vast unused capacity, to produce goods, medicines, even such basic needs as electricity, so that an economy which was allowed to grow back even if only to its 2010 state would be growing rapidly. Second, Yanis Varoufakis the Syriza finance minister, writes regularly in English, chiefly on his own blog. In 2012, he was interviewed by a website on Grexit. In Varoufakis’ now-familiar, paradoxical style, he argued that Grexit was impossible not because it would have negative connotations for Greece but because it would be self-defeating for the other European economies. The whole point of creating the common currency was to impress the markets that it is a permanent union that will guarantee huge losses to anyone bold enough to bet against its solidity. A single exit suffices to punch a hole through this perceived solidity. Like a tiny fault line on a mighty dam, a Greek exit will inevitably lead to the edifice’s collapse under the unstoppable forces of disintegration that will gain a toehold within that fault line. The moment Greece is pushed out two things will happen: a massive capital flight from Dublin, Lisbon, Madrid etc., followed by a reluctance of the ECB and Berlin to authorise unlimited liquidity to banks and states. Exiting the euro is not the same as cutting a peg (as Argentina did a decade ago) or exiting the Gold Standard (as Britain did in 1931, followed by the US a year later). The profound difference is that Argentina and Britain had their own currency and they simply severed its link to some exogenous hard currency – allowing it wisely to drift ‘south’ in order to restore competitiveness etc. Greece, Spain et al do not have a currency to devalue. We must do something that has never happened in history: Create a currency in order to devalue it! And since it takes months to create a currency, we are talking about driving countries that are already savaged by recession into an un-monetised state for months on end … One only needs to state this to realise the immensity of the hardship it will create. As for an ‘orderly’ exit, there can be no such thing. One only needs to think a little bit about what that ‘orderly exit’ might entail to realise that it is an impossibility. For the moment it is announced, all hell will break loose. Greek ATMs will run out, immigration officers in airports and ports (not to mention land crossings into Bulgaria and Turkey) will have to search people for cash, the banks will be closed indefinitely. Although these articles do not make the link explicit, it would not be fanciful to see behind the fear of devaluation (and inflation) the fear that a lasting run on the Greek banks would permanently set the Greek middle classes against Syriza, in the same way that 1923 turned a generation of Germans permanently against Weimar. Syriza received one of its highest votes in the Piraeus B district, he notes, where the electorate includes many dockers and their families. He is proud of the part that he and other activists have played in winning the workers to Syriza – a process which took place largely outside the workplace, including through initiatives such as Solidarity for All in Piraeus, which provides food kitchens for workers without ever (unlike the food kitchens run by Golden Dawn) asking about their immigration status. I was quite open to hearing such opinions but I was not persuaded that they have a clear answer especially for the first period of a transfer from the euro to a local currency. They didn’t convince me that they have something concrete to propose to the people for those first critical six months of transition. And you know, our society is not trained or educated to suffer under such terms. For example, if you leave the euro, the iPhone will be three or four times more expensive. I don’t care. I don’t give a damn. But many people give a damn about some items that they don’t even have the power to buy in euros. So I’m ready to wait for gasoline and to do my part and not to demand more but I know many guys around me that would be happy to simply take their share and their family’s share for the month. So I think we’re not trained well enough to confront such a danger. There is not yet a “Greek revolution”, what we have rather is a left government trying to do what it can where the level of strikes has been falling for two years, where the strikes have been largely limited to the public sector, and where millions of ordinary Greeks – not merely the rich – have been removing their savings from the banks. Whether Grexit will become a reality or not is likely to depend not only on the terms demanded by Berlin, nor only on the attempts by Syriza leadership to find a breathing space, but whether the likes of Giorgos Gogos reconsider and conclude that Lapavitsas or Varoufakis is in the right. There is a (relatively) simple choice facing the Greek left on Grexit. Either build a strategy based on developing a European Union wide opposition to austerity or bank on a return to what would be a drastically devalued Drachma offering a less traumatic path to economic recovery. Quite apart from the problems with a devaluation strategy rightly outlined by David, it assumes a Greek economy with a substantial and proven export sector. Sadly that does not really exist. The collapse in employment and living standards which would follow on the collapse of a new Drachma would have to be of nightmare scale and duration before such a substantial export sector could be brought into existence. Yes, there are massive political problems in opting for an EU wide change of strategy as well. But there are clear indications that opposition to the Euro-area austerity obsession is growing (most obviously in Spain, Portugal and Ireland – but also in Italy, France and a number of central European countries. Divisions are starting to appear among even establishment pro-austerity economists about the wisdom of the entire policy. Even Labour may not be able to take office here without delivering some change in policy to the SNP, Greens and others after the election. Syriza is indeed faced with the necessity of fighting a protracted a war of position. Initial progress will be painfully slow. But Grexit would involve political surrender and might open the door to power to the forces of the Greek far right. It’s often forgotten that a too strong currency (like the euro is for many eurozone countries) harms not only exports but also domestic production: the greeks are importing too cheap foreign products, so domestic production is destroyed. A greek currency devaluation would create the necessary conditions for the resumption of domestic production. Point taken Zoe – it’s part of the Lapavsitas argument which I was summarising (badly) above that the fall in Greece’s GDP implies a large unused capability which could be restored, and he gives some very practical examples of how this would be done eg in terms of electricity supply to show that the infrastructure and capability is still there for output to increase. How though to rekindle the demand in order to take up the spare productive capacity? (and at the same time as introducing a new currency, after each of a 25% GDP fall and a savers’ strike against the banks)? Yes, David, though I am in favour of Syriza fighting to stay in the Euro, far better that they be pushed out than that they should voluntarily jump off the cliff – for the reasons you give. However it will be no easy matter for the Euro-area chiefs to expel Greece from the single currency. There is NO legal provision for this. …we are talking about driving countries that are already savaged by recession into an un-monetised state for months on end … One only needs to state this to realise the immensity of the hardship it will create. If this is Syriza;s position then their whole campaign was a lie. Obviously Grexit is no one’s first choice, but Varoufakis is basically saying that Papandreou and the others were right: Greece has to be run from Berlin and there’s nothing anyone can do about it. Grexit has profound costs to society that many on the Left want to ignore. At one point, 60% of the citizens of Argentina were living below the poverty line. Greece already has deep problem of poverty now and adding the costs of a Grexit will be like piling a depression on top of a depression. It can be done, but the costs will be incredibly painful for SYRIZA and Greece.